Fruitamin Soap produced by renowned companies namely Wink White Thailand. 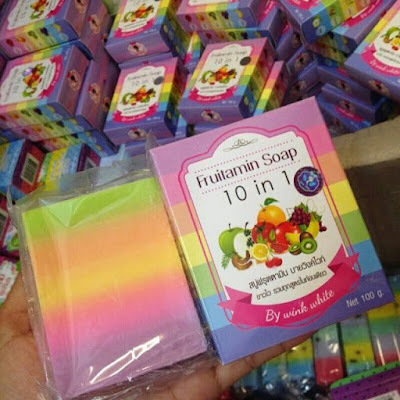 Fruitamin is Whitening Soap Soap which contains 10 kinds of fruit packed in 1 piece of soap and also a combination of 6 variants Gluta Soap. And there are five colors that integrate all of the content from natural fruit extracts. Soap Fruitamin latest formula 10 times more effective than the old packaging formula. This product is perfect for those of you who are doing skin care. Because the results obtained after using this product very much at all, other than skin become white and smooth, this product can also take care of your skin daily. This soap also serves as nutrients and vitamins for our skin. Because the skin as well as the body, too, need vitamins in order to maintain and take care of the inside. Good skin care, you can do in two ways, first by external treatment, the treatment of the skin by using soap or lotion. While skin care from the inside is by consuming a vitamin or supplement daily with dose must have been determined. Well if two nurses leather that you can do, your skin will be beautiful, not only from outside but from the inside as well. Fruitamin Soap is made from a mixture Gluta + Vitamin + Fruit. And other natural ingredients to help nourish the skin and can also whiten the skin. The composition is made up of several fruit extract which is very natural and not harmful to our skin. Vitamins and nutrients contained in fruits is very good for our skin. Use this incredible soap every day so that our skin becomes more manicured and healthy.